Railways have always fascinated Lorraine, the editor of Doverhistorian.com. Indeed, if Dr. Richard Beeching’s (1913-1985) advice had not been heeded some eighteen months after she started working for the Eastern Region of British Railways, her career would have taken a very different direction. These days, one of the beauties of being a senior citizen, is that together with advance fares her and Alan, her husband and member of the team – railcards allows them to indulge in her passion. Someday, Lorraine hopes, that one of her dearest wishes will come true and she will travel on the Golden Arrow. On 19 August 1921, the Railways Act received Royal Assent that proscribed all the railway companies, which were in private hands, to merge into four ‘Groups’. One of these was the Southern Railway Company and was made up of railway companies that operated south of the Thames. These included the two companies that served Dover – South Eastern Railway Company, which used the line through Shakespeare Tunnel to the then Town Station and Marine Station, at Western docks; and the London, Chatham and Dover Railway Company, which went to the Marine Station via Priory Station and Harbour Station. Southern Railway came into operation on 1 January 1923. Not long after, Southern set up the first professional Public Relations department on the railway network. Under the influence of John Elliot (1898-1988), it was instrumental in creating the positive image for both the company and the places it served. 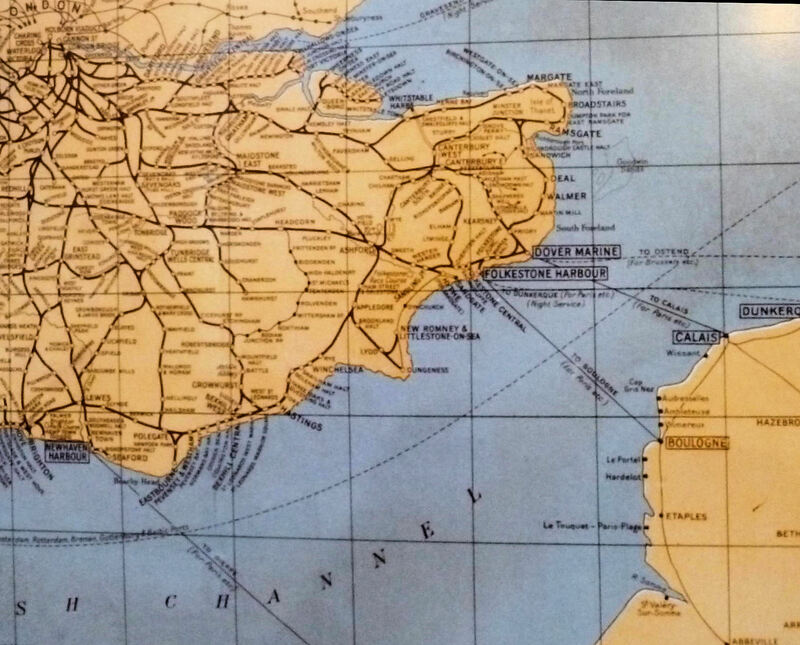 This included boat trains and the company introduced Southern’s Continental Handbook, which listed destinations across the Continents as far as Japan and included a fold-out map giving the appropriate railway lines serving each country. At the time, Davison Alexander Dalziel (1854-1928) was the chairman of the International Sleeping Car Share Trust Ltd, better known as Wagons-Lits. It is generally accepted that Dalzeil put forward the notion of Southern’s Continental Express boat train that was introduced on 14 November 1924. Designed to be the height of luxury, it consisted of six first class Pullman cars, a baggage and a brake van. Like all boat trains to Dover, the London terminus was Victoria Station and the luxurious Continental Express left at 10.50hrs connecting with a packet ship at Dover and the return Continental Express train left Dover for London at 17.30hrs. In 1848, New Yorker George Mortimer Pullman (1831-1897), the third of ten children, went into business with his father James – a cabinetmaker, as a salesman. This meant he had to travel a lot and in those days in the US it was by train. His journeys were uncomfortable as the seats were often bare wood, there was no heating and lighting was by candle. On one particular overnight journey it was so uncomfortable that Pullman could not sleep. Instead, he spent his time measuring the carriage and considered ways of redesigning it to meet his, and he was sure, other passengers needs. Becoming a successful engineering contractor, Pullman persuaded the Chicago & Alton Railroad to loan him two carriages. In these he installed seats that could be converted into beds that were placed longitudinally and were designed to provide the height of comfort and luxury. The carriages also had washrooms, oil lighting and other luxury trappings and were inaugurated in August 1859. An immediate success, the Pullman Company developed what became luxury hotels on wheels and included dining cars, lounge cars with a library and on some, a barber and a hairdresser! The first Pullman service in Britain was introduced in 1874 by the Midland Railway Company between London’s St Pancras Station and Bradford. The first Pullman car on a boat train was on the London, Chatham and Dover Railway’s Jupiter in 1882 from London Victoria to Dover and connected with the packet Invicta for Calais and a through service from the French port to Turin and Milan via the Mont Cenis Tunnel. The Continental Express, had the classic Pullman livery of umber and cream but with white roofs as Southern felt that they looked ‘better’. The carriages were pulled by a King Arthur class locomotive, originally designed by Robert Wallace Urie (1854-1937) and advanced by Richard Maunsell (1868-1944) in 1925 as the N-15 class. Each locomotive was named after a character from the court at Camelot and the name of the locomotive and number-plates were of polished brass with a background of either red or black. The French, in September 1926, followed Southern’s lead and launched an equivalent all-Pullman train between Paris and Calais and given the name Fléche d’Or. To take passengers across the Channel, Southern Railway had ordered the Canterbury from Denny’s of Dumbarton shipyard. In the meantime, the company decided to up grade the Continental Express with a new train given the anglicised French name … Golden Arrow! This new luxurious train consisted of 10 Pullman cars, hauled by one of sixteen 4-6-0 Lord Nelson Class engines sporting a Union Flag and Tricolour. At the time the Lord Nelson class was introduced, in 1926, they were the most powerful engines in Great Britain with a tractive effort of 33,510lb. 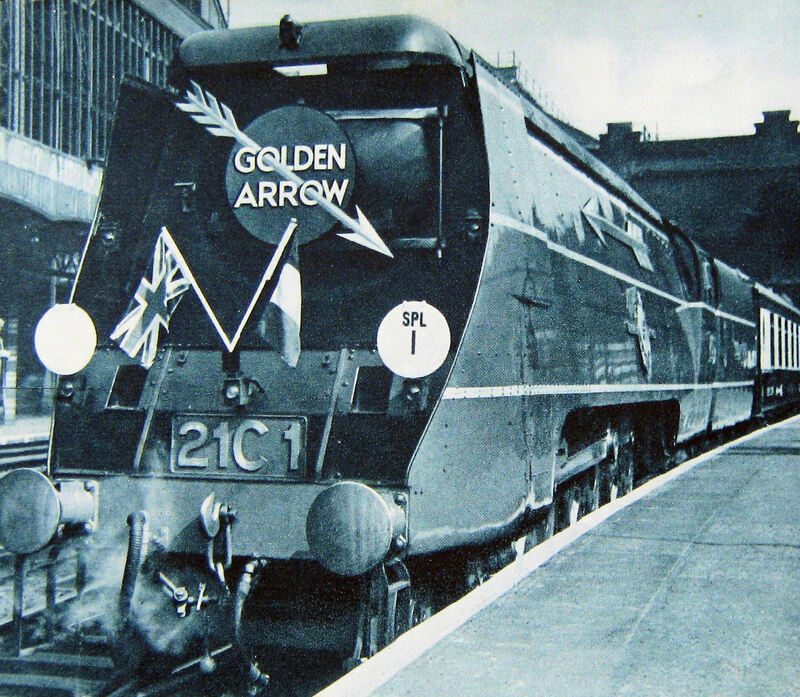 Southern Railway’s Golden Arrow crystallised the classic British version of the Pullman. The interior was panelled with exotic woods inlaid with decorated marquetry and gilt fittings. The floor was thickly carpeted and at each window were plush curtains. There was a parlour car, which furnished with well upholstered, free standing armchairs, each one facing another across a table for two. There were two rows of these either side of a central gangway. On each table was a freshly laundered tablecloth, a lamp with a silk warm coloured shade resembling an inverted tulip. 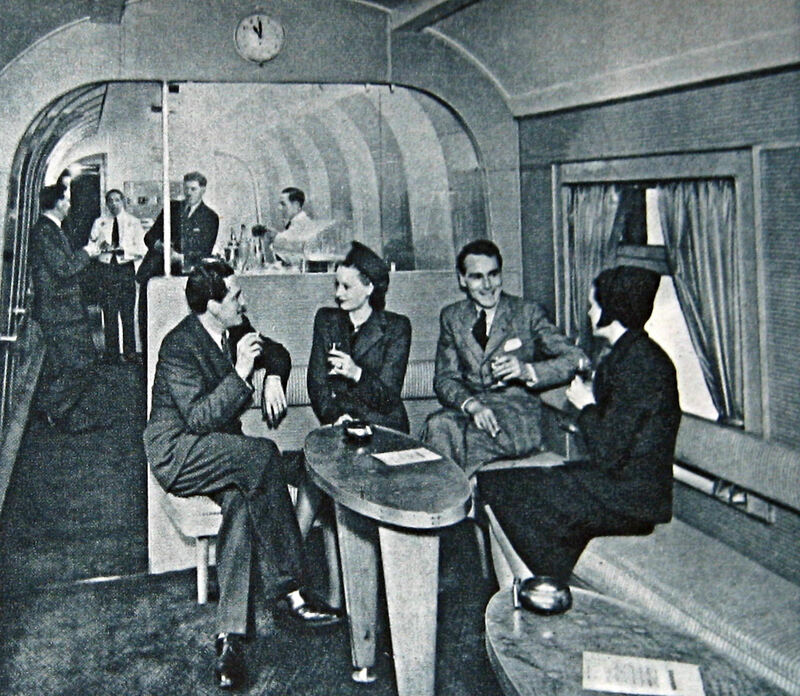 On board was the ‘Trianon’ cocktail bar, a converted twelve-wheeled Pullman modelled on a high-class club for the rich. The train also boasted of the first public address system and passengers were addressed in both English and French. The train also had electric lighting, steam heating and air-conditioning. The name of each carriage was painted in an ornamental frame below the windows. The word Pullman was painted in elongated gold lettering above the windows. 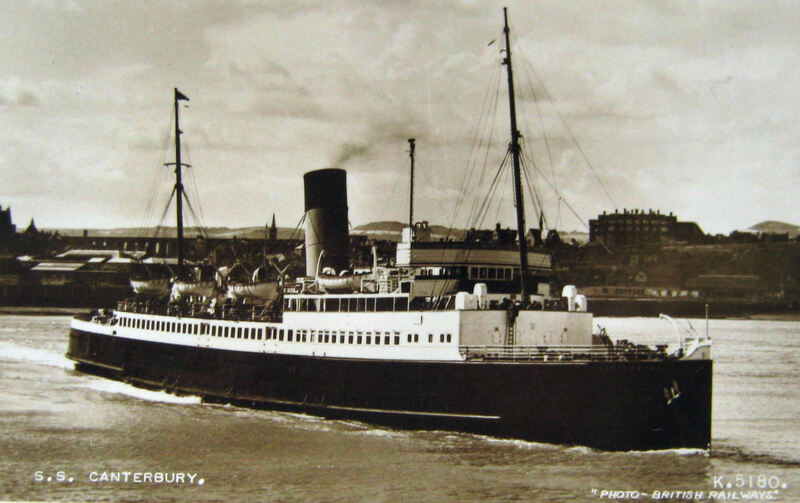 The Canterbury was launched on 13 December 1928 at Dumbarton. Of 2,910tons gross, her length was, 329 feet 7 inches (100 metres) between perpendiculars, a beam of 47 feet 1 inch (14.4 metres) and a draught of 16 feet 10 inches (5metres). 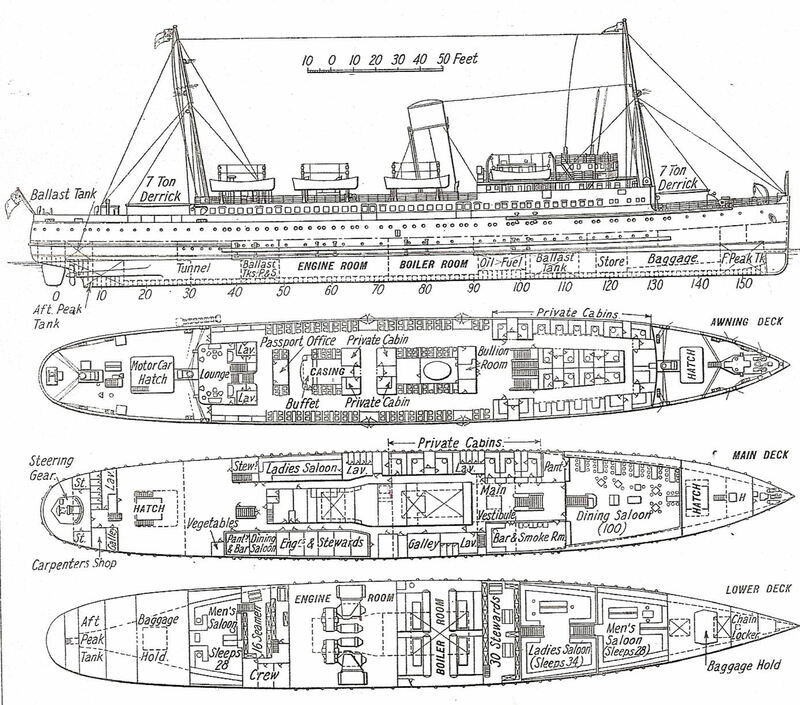 The majority of the decks were occupied by passenger quarters, of which she was capable of carrying up to 1,700. However, she was only expected to carry 300 – 400 passengers because of the clientele she served. Four geared turbines taking steam from four water tube boilers that were served by a single raked funnel drove the Canterbury. She arrived in Dover on 30 April 1929 and at Victoria Station at 11.00hrs on 15 May Southern introduced its Golden Arrow service and at Dover the Canterbury commenced service on the same day. 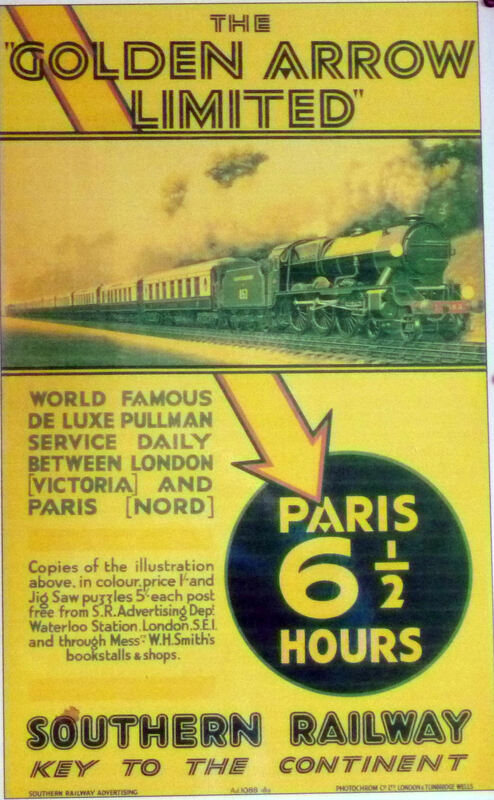 The journey between London and Paris was advertised to take 6½ hours and the single fare cost £6 10shillings (£6.50p). 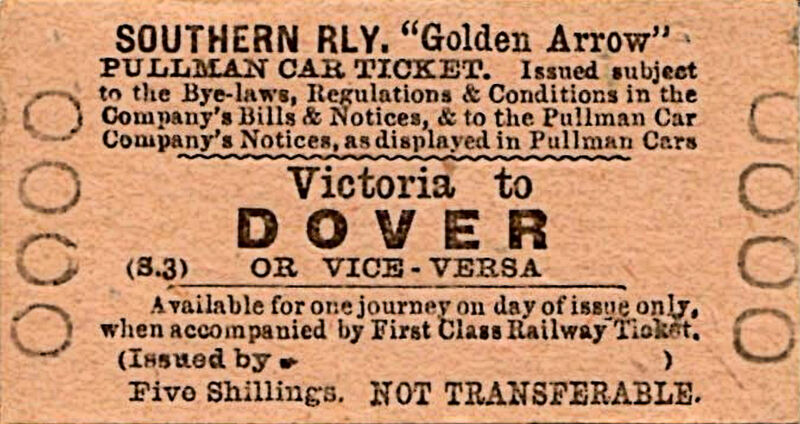 The Golden Arrow was scheduled to depart London Victoria from platform 2 at 11.00hrs and reach Dover Marine Station at 12.38hrs. Apart from the climb to the Knockholt summit, the line is fairly level with a very long straight section between Tonbridge and Ashford, such that speeds of 96kph (60mph) were not unknown. Having crossed the Channel in the Canterbury on reaching Calais the passengers were transferred to the awaiting Fléche d’Or, a four-cylinder Nord Pacific of the French Northern railway, arriving in Paris at 17.35, (English time). Passports were examined by immigration and personal baggage was examined by customs before boarding the train. As larger baggage was put into the baggage wagon, at the rear of the train, it was also examined by customs prior to leaving London or Paris. The owners of the baggage were given a personalised ticket, to show that it had been registered, with its reciprocal stuck onto the appropriate piece of luggage. Occasionally customs and/or immigration officers travelled the route and dealt with concerns. At Victoria station there was a blackboard on which was written the state of the sea that day. In March 1929, the New York Stock exchange, on Wall Street, wobbled and on 20 September 1929, the London Stock Exchange crashed. Following which, top investor, Charles Hatray – who lived at St Margaret’s Bay – being sent to gaol for fraud and forgery. Stock exchange instability gave way to deterioration and on Wall Street this gained momentum. On Black Tuesday, 29 October 1929, Wall Street crashed. The repercussions were felt around the world leading to a major economic depression. The Southern Railway annual reports for 1929 and the following two years reflected this with the non-viability of the Golden Arrow and the Canterbury holding centre stage. It was noted that on the Dover-Continental passage, the number of passengers travelling second class (the same as 3rd class on trains), during the year ending February 1931 had increased by 28,000 but the number of first class passengers had fallen by 50,000. Further, much of the increase in traffic was on the Ostend route, where ships were under the control of the Belgium Government. Following the report, the decision was taken to introduce, in May 1931, third class carriages on the Golden Arrow. At about the same time the Canterbury was modified to allow for the two classes of passengers. Ticket prices remained the same for the first class while for second/third class passengers it was £4.10s (£4.50p) each way. 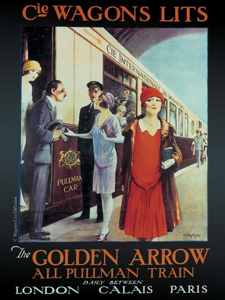 As the economy recovered the Golden Arrow service gained more passengers in both classes. On 14 January 1939 the British Prime Minister (1937-1940) Neville Chamberlain (1869-1940) together with Edward Wood, 1st Earl of Halifax (1881-1959), the Foreign Secretary (1938-1940), travelled by way of Dover, using the Golden Arrow and the Canterbury, for Rome. This was to meet with Benito Mussolini (1883-1945), the Italian political leader, in an effort to persuade him not to become involved in the pending conflict. World War II was declared on 3 September 1939. The Canterbury left Dover for Calais, following the Golden Arrow’s last trip, for the duration of the war. She was then converted into a troop carrying ship. 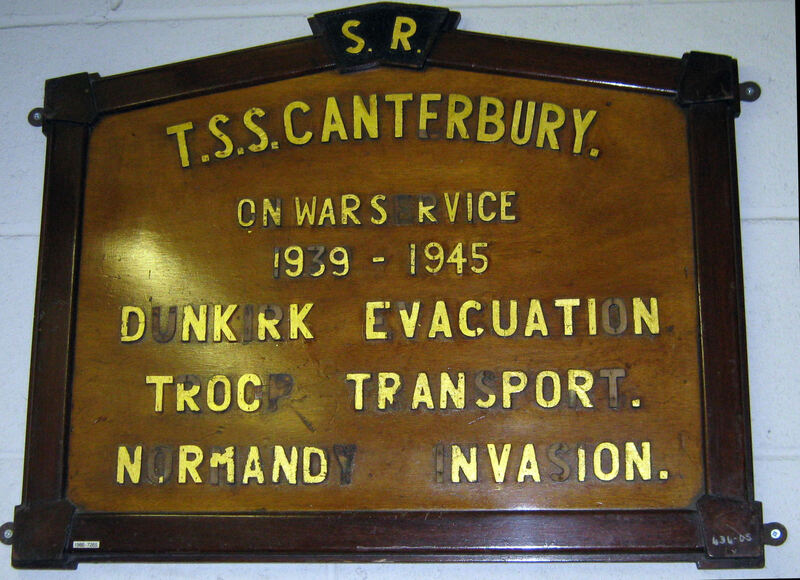 On the afternoon of 29 May 1940, during the Dunkirk Evacuation, the Canterbury was attacked and badly damaged. Nonetheless, having returned to Dover and patched up was back rescuing soldiers from the beaches on 3 June. She became, in February 1943, part of Force J along with another Southern Railway vessel, Isle of Thanet. The Canterbury took part in the D-Day landings of 1944, sailing from Southampton, she landed her contingent of troops on Juno Beach on 6 June. After a distinguished war service, the Canterbury was given a refit, which included the installation of radar, and returned to Dover. 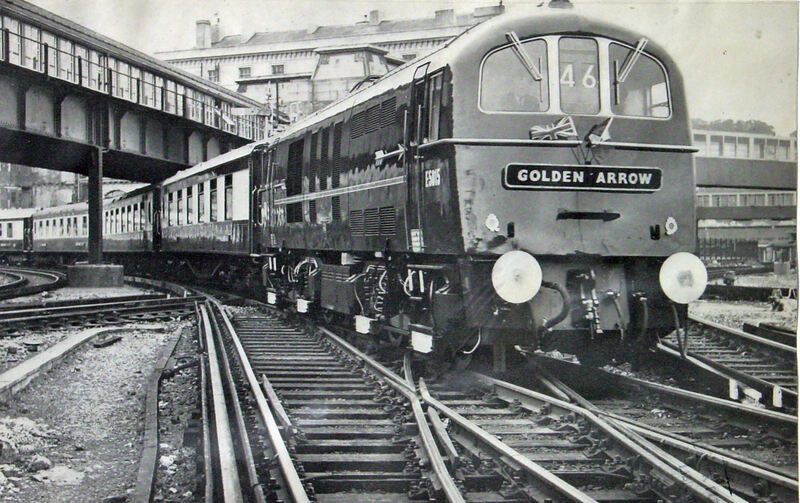 The Golden Arrow service resumed on 15 April 1946 using pre-war rolling stock and that evening, on BBC Home Service radio, was a special programme. This was to celebrate and a gala dinner was also held at Charing Cross hotel, London. The train was allocated to Stewarts Lane shed, a large railway servicing facility at Battersea, London that had been founded by the London, Chatham and Dover Railway Company back in 1862. Considerable expense was lavished on both the engine and carriages of the Golden Arrow and the train proved popular from the outset. The cost of tickets on the service was retained at pre-war prices but the journey, because of the poor state of the French railways, was scheduled to take 8½hours. Nonetheless, on arrival in Calais, there were coaches available to take passengers to Basle, Lausanne and Milan. Shortly after, Oliver Bulleid’s (1882-1970), Merchant Navy Class 4-6-2 engines replaced the Lord Nelson Class engines of the Golden Arrow. Introduced in 1941, these engines had an all-welded boiler, chain-driven valve-gear and, at the time, a novel air-smoothing casing. It was reported that until June 1961, before leaving the shed for the day, the engine’s freshly washed special circular Golden Arrow headboard was mounted on the smokebox door and the wooden horizontal arrows were secured on special attachments on the side of the casing! The white route discs, freshly painted when needed, were fixed above each buffer on the lamp brackets and finally the Union Jack and the Tricolour was fixed on a vee-shaped carrier on the buffer beam. The ship Invicta, had been built in 1939 to take over from the Canterbury but was commandeered for war work following her launch in 1940. On demobilisation, she was converted to oil fuel having been originally designed to use Kent coal. 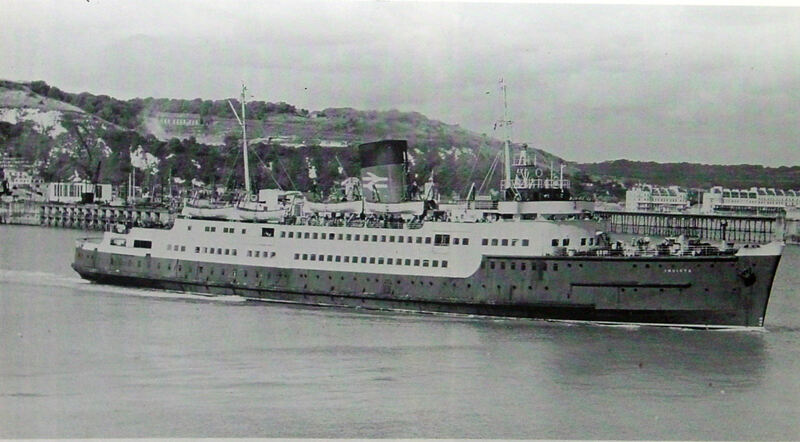 Fitted with radar, on 10 October 1946 Invicta came to Dover to take over the Golden Arrow service. The Invicta was also Southern Railway’s flagship and Len Payne was appointed Master. Five days later, the Canterbury, was transferred to the Folkestone-Boulogne service until 27 September 1964, when she was towed away to Antwerp to be scrapped. The Golden Arrow celebrated the first post-war year on 15 April 1947, having carried 180,000 passengers but October saw the introduction of travel for pleasure restrictions. Although the Golden Arrow service continued, the number of passengers fell dramatically. As the economy began to pick up the restrictions were lifted and the service regained its popularity. On 1 January 1948, with the nationalisation of railways, the Southern Railway became Southern Region. In 1951, the Britannia 4-6-2 Standard Class 7-MT, was introduced to the service. One of these, the William Shakespeare, finished with standard green livery, was exhibited at the 1951 Festival of Britain. 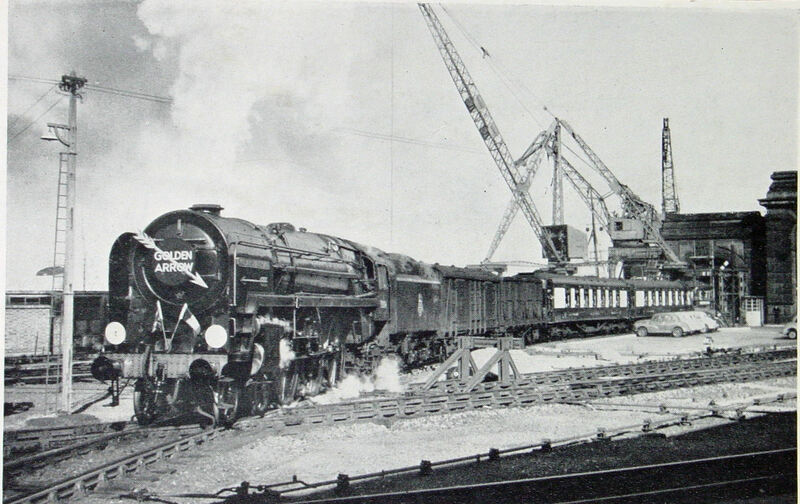 Variants of the original Merchant Navy class such as Battle of Britain and the West Country classes were used along with British Railway’s standard Pacifics. 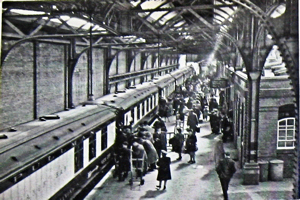 In October 1952 the outward journey on the Golden Arrow service was transferred, for a short while, to Folkestone. Then on 19 December 1955, Southern Region’s commodore, Len Payne collapsed and died just as the Invicta was about to leave Dover for Calais. Later that decade, the Kent Coast electrification scheme began and it was goodbye to steam engines. It was a West Country class steam locomotive that pulled the Golden Arrow bound for Victoria in June 1961 before electric engines were introduce. The crew were Tom Crabb of Melbourne Avenue driver – who was due to retire – and fireman Eric Brereton of Friars Way. The Mayor, railwayman, Robert Eade, councillors and crowds of locals waved goodbye. Other trains gave whistle salutes. The Golden Arrow electric locomotive carried a plain rectangular headboard and the two flags. There were short horizontal arrows on the side behind the cab doors. At the time, the demand for the service was beginning to wane in face of competition from the car. The Invicta made her last Golden Arrow sailing on 8 August 1972 and the last Golden Arrow, train ran on 30 September that year. In spring 1985, the Golden Arrow featured on 22p stamps, in the Post Office’s ‘Famous Trains’ series. At the inauguration of the Channel Tunnel in May 1994, a Britannia class steam locomotive pulled Golden Arrow Pullman cars. When Marine Station closed that year, it was the Britannia class, Iron Duke – named after the Duke of Wellington – which hauled the last train to use the station. 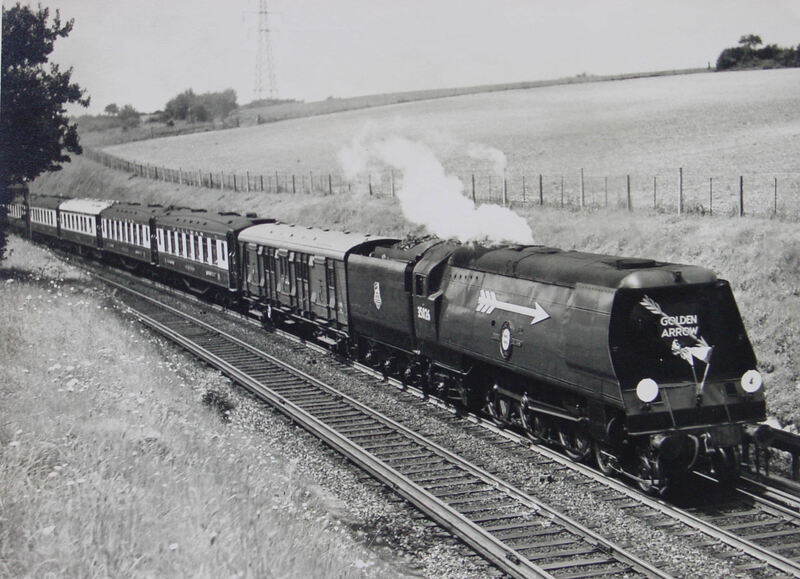 In the summer of 2003, the Golden Arrow, operated by Wessex Trains, made the first of a series of journeys pulled by the Battle of Britain class engine, Tangmere. Thus, the memory of the Golden Arrow lives on and, of interest, when the then Strategic Rail Authority (2001-2006), on 15 October 2002, launched a programme, in an effort to raise serious money from the private sector, they named it the … Golden Arrow! This entry was posted in Golden Arrow - The Luxury Train, Port and Transport. Bookmark the permalink.